Want to find out more about Turnitin? 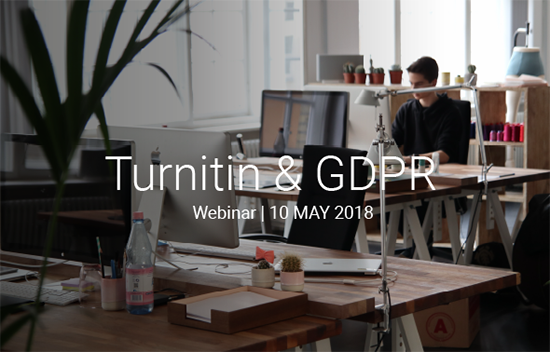 During this webinar our International Commercial and Legal Manager (and acting data protection officer for Turnitin), Giles Kerrush, will talk about all the actions Turnitin has undertaken over the past few months to ensure complete GDPR compliance. He will also explain how Turnitin has evaluated and updated its data privacy practices to satisfy the requirements set forth by GDPR. Find out how the GDPR regulations affect you, as both a Turnitin customer and Data Controller. Discover what measures Turnitin has taken to ensure our services are completely GDPR compliant and leave the session confident that Turnitin is supporting your institution to be compliant as well. Have an opportunity to participate in a live Q&A session with our acting data protection officer. Fill in this short form to join our webinar and learn everything you need to know about Turnitin and GDPR. If you can't make the webinar live, you can still register! We will send a recording of the webinar following the session. Turnitin actively partners with educators and institutions to enhance academic integrity and excellence through formative tools and educational resources. Our aim is to help instructors promote originality and critical thinking skills, streamline feedback and deliver smarter grading for better outcomes. Turnitin is used by more than 26 million students at 15,000 institutions in 140 countries. To find out more about why they choose to partner with us, please visit our website.